If there can be such a thing as a typical American billionaire, David H. and Charles G. Koch do not fit that bill. They are not just among the richest Americans -- $100 billion and counting -- they are deeply political libertarian industrialists. They have worked in the shadows for decades to bend government to do their bidding or to destroy it, becoming richer while attacking social safety nets in many areas -- environment, education, voting rights, union organizing. No other billionaire has that political track record. 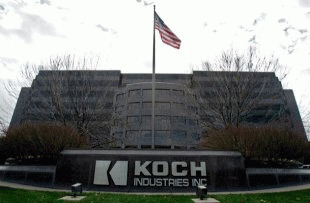 Under today's Supreme Court's ongoing deregulation of campaign finance, the Kochs have become more influential than ever, leading and commandeering hundreds of millions of dollars for elections, all to support an agenda that preys on average Americans. But that's hardly surprising, given that their father made the family's first fortune in the 1930s by building oil pipelines for Soviet dictator Joseph Stalin. At home, he supported racial segregation and the white supremacist John Birch Society. In 2012, I released the first Koch Brothers Exposed documentary because I felt the public needed to know about these political puppet-masters. I had not heard of them until I read Jane Mayer's brilliant New Yorker profile. As I read her article and began my research, I quickly knew that this would lend itself to a strong documentary. Fundamentally, this is a story about America's most politically aggressive billionaires using their money to support and increase both their fortune and ideology. Their successes have come at the expense of regular folks, deepening inequality in America. I felt we could do it and reach an audience in the emotionally forceful way that film does; through personal stories, but also showing that policy impacts people. We found some very powerful personal stories making clear how the Kochs' money and influence were affecting ordinary Americans, from the environment to school desegregation to Social Security. The Kochs reacted. They were not happy. They attacked me in vicious ways using online ads and distorted photographs of me. Their lawyers made legal threats. But they could not stop us. All that controversy resulted in more than 8 million views of the film or excerpts. After the Supreme Court's Citizens United ruling, we knew the Kochtopus was coming. But the size and scope of the political hydra that is their operation is mind-boggling. They threw multi-millions into the effort to elect politicans and buy policy. Meanwhile, calls for a new and updated version of the film mounted. When we saw what they had spent and had done in 2012, which exceeded anyone's wildest expectations, we had to do it. That led to Koch Brothers Exposed: 2014 Edition, which premieres in Washington, D.C., on May 20. There was a lot of new information and areas to develop. We rely on the work of wonderful investigative journalists and public-interest groups. Our job was to take the information -- some new, some older -- and weave it into a film. We were struck by their efforts to bring about the Citizens United ruling. They invited and brought Justices Antonin Scalia and Clarence Thomas to their secretive retreats for wealthy libertarians. They funded many of the right-wing groups that later filed legal briefs urging the Court to deregulate the kinds of outside campaigns that they run. After the Court's conservative majority ruled along those lines, the Kochs used the law to spend millions and millions more. Koch Brothers Exposed: 2014 Edition also showed the Kochs' agenda touches on issues that are not always associated with them, such as opposing minimum wage increases and backing voter suppression measures like new voter ID laws. We also showed how they are not always winning at the local level with issues like public education, even as they get involved in local school board races. We brought in union leaders like the American Federation of Teacher's Randi Weingarten and AFSME's Lee Saunders, who know their efforts to kill collective bargaining. We talked to Senate Majority Leader Harry Reid, who has been very critical of their way their political tactics undermine the political process. We talked to experts at democracy reform groups, especially those focusing on campaign finance. Our constitutional system is based on a public system of checks and balances, which the Kochs want to eviscerate for private gain and extreme right-wing ideology. We talked about federal solutions, so the public does not think this situation is hopeless. We want the film's 2014 edition to reach millions -- more than before. We can do that by making it available for free across a range of media platforms, not just in theaters. There's a diverse audience for this documentary: the public, political leaders, journalists, educators and activists. Two thousand donors helped us to make this film. They are not billionaires. They are people who believe in meaningful participation and democracy. They want to encourage debate, reform efforts and a better public understanding of the forces shaping American politics. Films help people understand that this is not an abstract fight, but one with real-life impacts. The Kochs are poster boys not just for economic and political elites abusing the system, but about the lack of fairness in American politics and society. Having billions is not implicitly bad, but it is another thing to aggressively use it to increase their vast wealth, impose their radical ideology, and intentionally undermine the political systems' checks and balances. Koch Brothers Exposed: 2014 Edition connects these dots over its 50 minutes, hopefully inspiring Americans who care about our country to press for new solutions. America's fate depends on fixing the system, not allowing a handful of supremely wealthy people led by the Kochs to destroy our democracy.